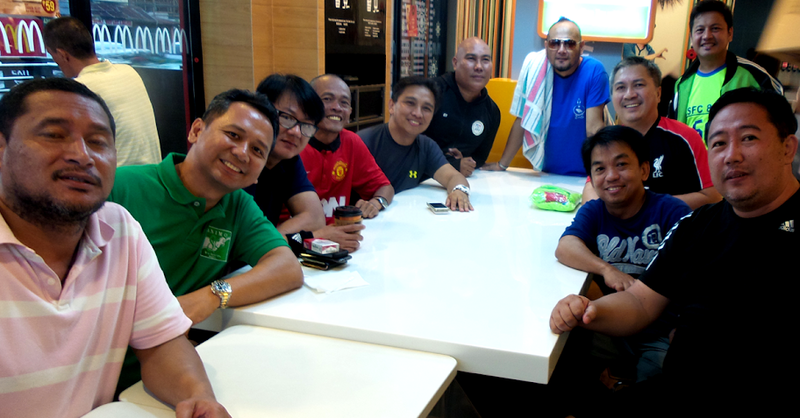 On the penultimate day of last year, after the annual DLSL football varsity reunion festival which is simply referred to as the LSFC Cup, one of the players from my high school football team of 1989 asked if I could meet up with the team after the festival. I was happy to oblige. These days, the way time has simply flown sometimes boggles my mind; and meeting up with the team, foremost in my mind was the fact that all of 26 years had passed by since the team had to be broken up by the scourge of all high school football teams – graduation. My 1989 team was the best team that I ever trained; and I say this without disrespect to the other squads. As we reminisced during our get-together, I pointed out to the lads that the 1988 team – of which many of them were also part – probably played the more attractive football. This was because we still had former national team player Eduardo ‘Tuteng’ Marasigan, a natural genius of the short passing game who wove together all our passing moves in the same way Andres Iniesta does for Barcelona. One thing that set the 1989 squad apart, however, was that it had a stronger defence anchored on the one-armed Jonathan Casas and the six-footer Jerry Acosta. Moreover, the squad had options, something many of my other teams did not possess. While there was nobody in the mould of a Tuteng Marasigan, this team had a core of 16 or so players of more or less the same technical calibre. This was also a team of fighters who could not only play silky football but were also not averse to dishing out the physical side of the game. For instance, the college team of San Beda came to play us in a friendly and the lads matched our older opponents for physicality. We won 3-1. Because we played in the Coca Cola Go-for-Goal, I knew that this team was among the best high school teams in the country at the time. Although we lost narrowly to teams from Iloilo and Bacolod in successive national editions of the Coca-Cola tournament, there was no shame because both cities were, even then, football hubs. In contrast, to this day, there is no real football culture in Lipa, our home city. Yet, back in the late eighties, we were beating teams from Iligan, Cebu, Dumaguete and Davao. The irony is that since, these cities have become themselves football hubs. These days, these cities have become feeders of the country’s top football leagues like the NCAA, the UAAP and the UFL. Meanwhile, the last full international we produced was Jeremias Jiao, who graduated as far back as 2001. To a certain extent, I myself was indirectly responsible for the decline of our football. As the years passed, I was also moving up the administrative ladder at DLSL; which naturally meant that I could not give my football teams the same hands-on attention I used to give in the eighties. But this was not the only reason. As I told the 1989 team during our brief get-together, they were so strong and so many that upon their graduation, a vacuum was created. In fact, only three players were left over from this team – Joel Carbonilla, Erwin Sibayan and Omar Leyesa. Although I had an under-16 team waiting to take over, the 1989 squad was always a hard act to follow. There also the little matter of players in the nineties having so many more distractions in contrast to those in the eighties. In the eighties, because Lipa and the rest of Batangas were pretty much still agrarian in nature, football training was actually a form of entertainment because there were few other things in the way of distractions. Also, back in the eighties, the weekly trip to Manila for RIFA matches was something to look forward to. By the nineties, a trip to Manila did not have the same appeal. However, by and large the real reason why football in Lipa has been overtaken by those in other cities has always been because the community has never really taken to the game. Yes, even when our successes back in the eighties could have been an inspiration for others to pick up the game. An Ilonggo referee I once talked to during a RIFA match gave me a clear insight as to why this has been so. He said that in Barotac Nuevo, where he was from, mothers were the ones who brought their young boys to football fields. There, the game was seen as a possible avenue to getting into the Armed Forces teams. In contrast, in Lipa many parents think of football as a dangerous game, likely in ignorance of statistics that have shown over the years that basketball is in fact more dangerous in terms of injuries sustained by players. Because football has never really been seen as anything that could lead to a career, support for it has always been lukewarm. In fact, I had known boys who had been scolded at home for joining the football team or for attending practice. The contrast with the attitude towards the game in Barotac Nuevo, I have to say, is quite stark. City government is also culpable. Whereas in mature football countries, local governments are active in the management of city and town football clubs, in Lipa there are no football fields outside of schools and the Air Force base which the public can have access to. Curiously, in Batangas City, where interest in football is enjoying something of a renaissance, there are two public football fields. The irony here is that the football in Batangas City was next to non-existent when we were almost singlehandedly flying the football flag for the rest of the Province of Batangas. Thus, while meeting up with my team of 1989 was something I totally enjoyed albeit it was brief, it was also tainted by the stark realisation that our football has not kept up with the same lofty standards that this team set 26 years ago. My teams of 1999 and 2011 could probably match 1989 for technical and tactical ability. What these teams lacked were options; and that was something that the 1989 team had plenty of. In fact, all of my other teams could have been so much stronger if so many more boys had taken up the game instead of me moulding a football team out of whoever found it worth the bother to go to the football field.